Another new addition to the family, that is on the technology front. 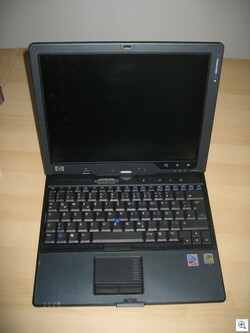 I’ve recently purchased an HP Compaq tc4200 Tablet PC. I’ve been toying with the idea of buying a tablet for quite some time now and have finally taken the plunge. I bought the Tablet PC mainly for it’s portability and also for it’s note taking capability. I’m using Microsoft OneNote in conjunction with the other features provided by the Windows XP Tablet PC 2005 Operating System to help me document stuff better. This particular Tablet PC is a combo, that is, you can use it as a normal laptop or as a Tablet as illustrated in the pics below. 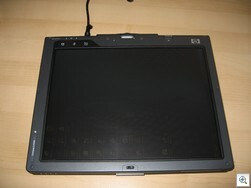 You’ll find what I would describe as an accurate view of the HP Compaq tc4200 Tablet PC’s capabilities here on ZDNet. I’ve owned/used a lot of laptops but this laptop has an interesting feature I’ve never seen in use on any other laptops, namely an Ambient Light Sensor. This is a small sensor which detects the level of surrounding light and adjusts the screen brightness accordingly. One of the other things I like about the Tablet is you can choose to work in either Portrait or Landscape mode by rotating the screen. So, I now have 5 screens to look at in my home office as shown below, namely an HP Pavilion zd7020US Notebook PC, Desktop PC, 14” TV , HP Compaq tc4200 Tablet PC and my work IBM X40. Great if you want to multi-task.